Our Weleda Calendula Shampoo and Body Wash gently cleanses and cares for delicate hair and skin Baby’s delicate hair and skin gets the perfect balance of cleansing moisture and the kindest care in our softly lathering Calendula Shampoo and Body Wash. This all natural baby shampoo is a gentle wash that retains the moisture in your baby’s hair and skin, leaving them feeling silky smooth and protected from drying out. An all natural baby shampoo and body wash that cleans and softens without synthetic detergents. 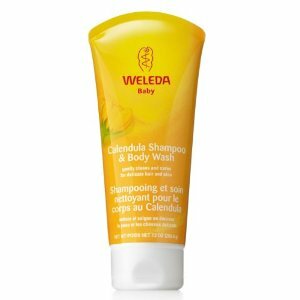 Formulated with the mildest organic and natural plant-based cleansers, Weleda Calendula Shampoo and Body Wash is gentle and tear-free. Biodynamic® and organic calendula flower extract in this all natural baby shampoo soothes and softens your baby’s hair and skin. Sweet almond oil absorbs fast and easily to keep your baby’s skin and hair from losing precious moisture. The gentle, effective formula of our Weleda Calendula Shampoo and Body Wash has a light and delicate fragrance that turns an ordinary bath time into a full-body pampering. Now that’s one clean, happy baby from head to shoulders, knees and toes (knees and toes). Ingredients: Water (Aqua), Coco-Glucoside, Prunus Amygdalus Dulcis (Sweet Almond) Oil, Alcohol, Disodium Cocoyl Glutamate, Sesamum Indicum (Sesame) Seed Oil, Glycerin, Chondrus Crispus (Carrageenan), Calendula Officinalis Flower Extract, Xanthan Gum, Lactic Acid, Fragrance (Parfum)*, Limonene*, Linalool*. For the first two years of my little girl's life I used Johnson & Johnson's baby wash products for bathing. She had a bit of eczema at one point but it cleared up with cream. No big deal. But eventually I noticed she was getting those icky bumps on the back of her arms known as K.P. (keratosis pilaris) that run in my husband's family. But hers were just awful and they got worse and worse after every bath. I know they make some products to treat it but I was worried about using them on my baby so I decided to start by switching her bath products to something less drying. The first ingredient I was avoiding was SLS. As it happened I'd recently tried another Weleda product and happened to spot this when I was reading something else on their website. I decided to give the Calendula Shampoo and Body Wash a try after reading the ingredients. Within a week of switching her bumpy arms showed improvement. I actually cried while giving her her bath one night there was such an improvement. I'd thought it wasn't going to improve without more severe medical treatment and the scarring I've seen from family members scratching the bothersome bumps was a constant worry. Not only does it smell great—it reminds me of lavender—and get her clean without over drying her sensitive skin, it's a decent shampoo for her too. It doesn't bother her eyes, though we're good at keeping it out of them. It leaves her curls so soft and bouncy, not tangled and dried out like other products did. I cannot recommend this product enough for parents who want a more eco-friendly and gentle option for their babies and toddlers. I'd use it for myself it smells so great! Notes: This product was purchased by me. My Sample Society Goodies Shipped!